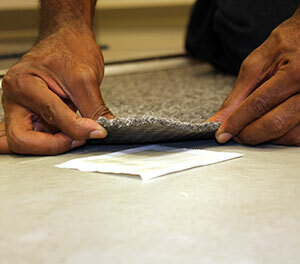 Installation of commercial carpet tiles with a liquid adhesive can be time-consuming, messy and hazardous. It also requires floor preparation, extended cure time and inhalation of dangerous chemicals during application. What’s the alternative to traditional liquid adhesive? Adhesive Squares are a non-toxic, odorless and cost-effective solution to installing carpet tiles. Your construction specifications may require soundproofing or a protective barrier of some type. These types of heavy-duty materials require a durable solution when securing them. Industrial materials, such as acoustic foam for sound proofing, or woven barrier textiles for protecting against harsh environmental conditions (rain, heavy force winds and airborne debris) require a durable solution. Adhesive Squares double-sided tape secures these materials to your desired surface.